Charles Fuller sets out from his house in Sunnyvale for a ride up Mt. Hamilton on March 5, 1914. Imagine riding up Mt. Hamilton on a single-speed, wearing cowboy boots and lugging a frying pan! Do you think you’d have to walk? You bet, and that’s just what Charles Fuller did on a hot spring day – Friday, March 5, 1914. But he made it. Fuller must have been an interesting character. At various times in his life he was a realtor, a Baptist preacher and then Sunnyvale postmaster, 1915-32. Fortunately he was interested in photography, and left behind photos of his high adventure on Mt. Hamilton. I can’t say with certainty that Charles Fuller the cyclist and postmaster are one in the same. A Charles R. Fuller lived at 693 W. McKinley Ave. in Sunnyvale in 1940 with his wife Anita, according to the census. He was 56 years old, which sounds about right. He would have been 30 in 1914. But I digress. Fuller planned leaving Sunnyvale at 1 p.m., but preacher Thomas M. Patterson insisted he do some duplicating and typewriting for him in preparation for an upcoming musical program. Stopping at a bike shop to buy a new tire, Fuller didn’t get started until 5 p.m.; instead of taking the train to San Jose, he decided to ride and enjoy the evening. In my research I’ve noticed many accounts of night riding at the turn of the century. Night riding has a certain allure (I rode down Mt. Hamilton under a full moon) and without traffic I can imagine it’s something cyclists of the day did with gusto. Fuller was a real Boy Scout. 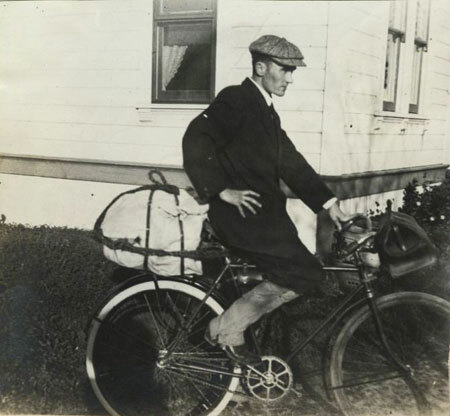 His bike was loaded down: oil cloth tent, poncho sleeping bag, heavy overcoat, small pillow, hair rope, 2 gunny sacks, and wool socks all in a white canvas duck clothing bag. In a leather bag on his handlebars he placed a broiler, frying pan, kettle, “granite” (enameled) pan, knife, fork, spoon, cup, and a salt and pepper shaker. After stopping to buy film, Fuller started climbing around 6 p.m. but in just 15 minutes he found himself walking. Can you blame him? That’s a mighty heavy load with no gears. 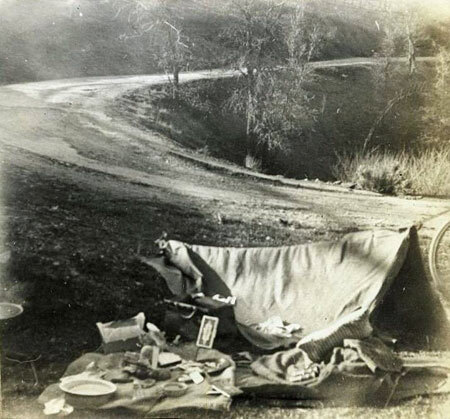 He soldiered on until midnight before stopping next to a creek off the road and pitching his tent. He was 9 miles from the summit so that would place him overlooking the southern end of Halls Valley. Only a wagon and a car passed him during his six-hour walk and ride. Occupy Wall Street? No it’s occupy Mt. Hamilton Road after a long walk and ride in the dark. After rising at 7 a.m. and eating breakfast, Fuller met two teens who were hiking up the mountain and they exchanged pleasantries before continuing. He left around 9:45 and reached Smith Creek an hour later. Back then a stately mansion near the creek served as a wagon stop and hotel. After lunch at the hostelry, Fuller began the long climb, but instead of following the road he headed straight up, following the telephone poles! It was one of those hot spring days with temperatures in the mid-80s. Lovely. He reached the summit at 3:30 p.m. and proceeded to tour Lick Observatory until well into the evening before taking his bike back down the way he came, avoiding the road once again. He camped at Smith Creek. Descent to Smith Creek with Lick Observatory in the background. It looks much the same today, but trees have grown back. Next day early in the morning Fuller was awakened by hundreds of motorcycles making their way up the mountain. This parade went on for hours. Fuller had a chance to ride most of the way back to Sunnyvale, but fell twice during the harrowing descent. 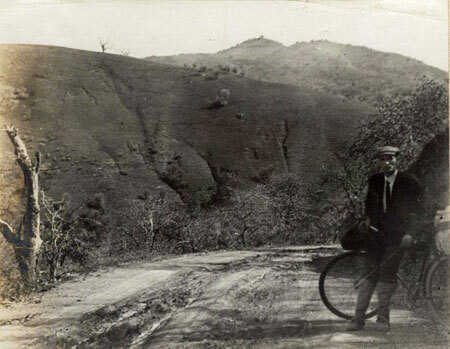 Remember, the road wasn’t paved and his bike must have been hell to steer. Thanks goes to Don Axtell for doing the research and finding Fuller’s photos preserved at DeAnza College, now in the Online Archive of California. Don is known for maintaining the spring on the steep backside of Mt. Hamilton about three miles from the summit. This entry was posted on May 17, 2012 at 7:49 pm and is filed under History. You can follow any responses to this entry through the RSS 2.0 feed. You can leave a response, or trackback from your own site.